There are professional diving centres in all of the main coastal towns and on the islands. Whether you’re an absolute novice or a seasoned diving expert you’ll find an organisation to meet your needs. There are great opportunities for wreck diving in and around Cavtat in the south as well as off the Istrian coast in the north, for example. Whichever region you visit you’ll find underwater caves, archaeological remains and diverse marine life to explore – all in crystal-clear waters. 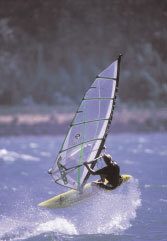 Although windsurfing can also be practised all along the coast, serious windsurfers should head to the two main sites at Bol (on the island of Brac) and at Viganj (on the Peljesac peninsula) where the maestral wind creates ideal conditions throughout the tourist season. Particularly impressive outside of the summer months as the water levels rise, those looking for an adrenaline rush should try whitewater rafting down the Cetina river canyon near Omis. Sea Kayaking has also become popular in recent years, particularly around Dubrovnik and Cavtat and on the islands of Brac and Hvar. Away from the coast, Croatia’s National Parks and Nature Reserves offer fantastic opportunities for hiking, climbing and cycling, and are all rich in flora and fauna. Many parks are just a short drive from the coast and enable visitors to experience another side to the country, as well as some truly spectacular views and scenery. The island of Mljet and the Kornati Archipelago are also protected national parks, as are the country’s two spectacular lake and waterfall complexes at Krka and Plitvice.